A luxury space to relax and observe your garden views. Our beautiful Orangeries will blend seamlessly with existing brickwork, blending property and extension together effortlessly. Add conservatory style, light and space to your home without compromising on privacy or efficiency. Their solid wall construction also gives you greater cavity insulation, providing you with all year round comfort whilst providing enhanced light from an 'open' glazed ceiling. If you are looking for a versatile, stylish and practical room to use all year round, then our Orangeries offer the perfect solution. High performance double glazing combined with brick insulation ensures the Orangery is a versatile living space with can be used all year round. Our stunning Orangeries will provide you with the extra room, light and space you always imagined. Warm, cosy and inviting throughout the year, you will never have to worry about overheating or cold spots. An Orangery can be used for many practical uses such as an extension onto your kitchen, dining room, living room and even a home office. The Orangery is much more versatile in terms of space and comfort, giving you endless possibilities when it comes to design. Always wanted a guest bedroom? How about a home Gym? 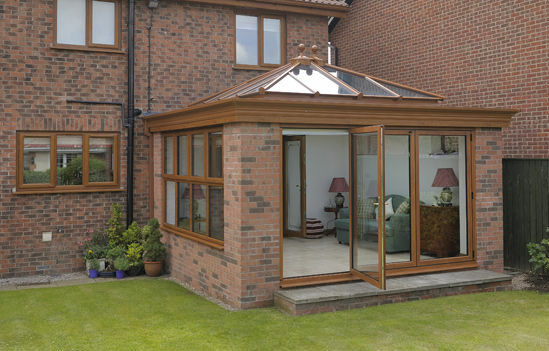 Our Orangeries will give you a versatile space perfect for all types of home improvement projects. Orangeries are constructed using a beautiful combination of brick pillars and glass, making them a sophisticated extension for any home. The added brick structure gives you greater privacy and insulation. Orangeries are great for south facing properties, where too much sunlight is an issue. An Orangery provides ample protection from the sun, allowing you to enjoy a conservatory space without overheating. A solid wall construction allows you to enjoy all year round comfort whilst still benefiting from lots of natural light from a beautiful, open glass ceiling.